Thinking about a surgical career? About to start surgical training? Do you know what to expect and how to thrive? The Hands-on Guide to Surgical Training is the ultimate, practical guide for medical students and junior doctors thinking about taking the plunge into surgery, and also for surgical trainees already in training. It’s full of invaluable, practical information and career guidance to ensure you get the most out of your surgical career. It offers general guidance and advice on surgical training, together with detailed information on each of the nine surgical subspecialties, each written by seniors and consultants, as you make both clinical and career-based choices. Undoubtedly one of the most comprehensive resources for surgical trainees available, The Hands-on Guide to Surgical Training will be essential reading throughout your training and surgical career. Take the stress out of surgical training with The Hands-on Guide! 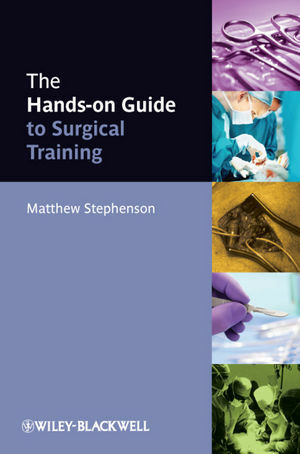 Matthew Stephenson is Senior Surgical Registrar within the South East Thames Rotation, and the author of How To Operate: for MRCS candidates and other surgical trainees (Wiley-Blackwell, 2011, ISBN 9780470657447). For those considering surgical training, or for those already progressing through this, “The Hands-on Guide to Surgical Training” is a very readable 304-page guide to the nitty-gritty key points no-one ever tells you about. Comprehensive in its coverage, the text starts with an introduction to the clinical side of surgery. Career structure, surgical equipment and sutures (with colour pictures) together with useful advice on theatre etiquette all offer an excellent introduction to those new to the operating theatre environment. The three most frequently encountered operations are reviewed, including operative photographs, and a guide to ward rounds and clinics provides a wealth of practical experience about what to do and when. The non-clinical chapters explain the different stages of training prior to entering core surgery, and each surgical specialty is then addressed in-depth including recruitment, exams and a trainee eye-view of what it is like to work in the specialty. What really makes this book stand out is the useful training information that all trainees want to know, but which is usually hard to come by and impossible to find in one place. Competition ratios for different surgical specialties, specific career advice for women in surgery, an overview of the training bodies overseeing surgery, the European Working Time Directive and pay-banding all stand out as very pertinent areas trainees should know about, but which are rarely often covered in similar textbooks. The pocket-size format of this book is perfect for carrying around at work and the text contains bold highlights to pick out the useful sections, although in some chapters this is perhaps a little over-done.